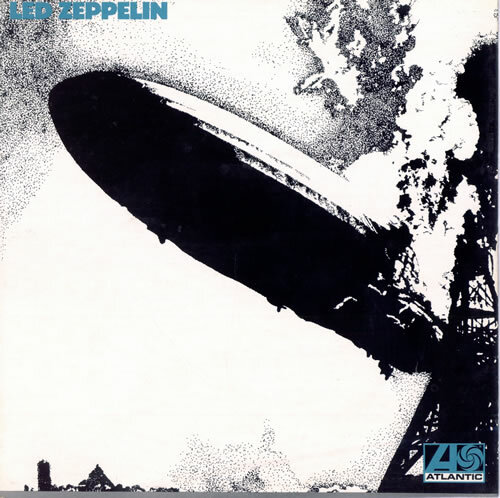 The iconic and short-lived original version of Led Zeppelin’s debut featuring the famous Hindenburg air disaster. The so-called ‘turquoise’ version was replaced within a matter of weeks with the much more familiar orange version. 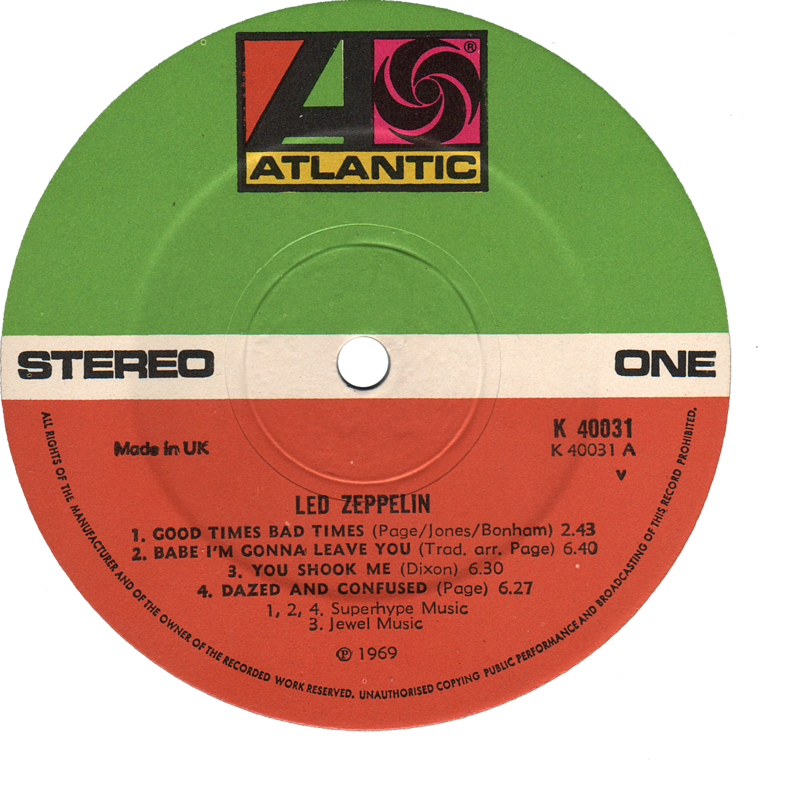 The very 1st pressing label features a publishing credit to ‘Superhype Music’. There is another version that has incorrect numbering in the publishing credits (above right). Note the grey stripe at the base of the front sleeve on both the orange and turquoise versions. 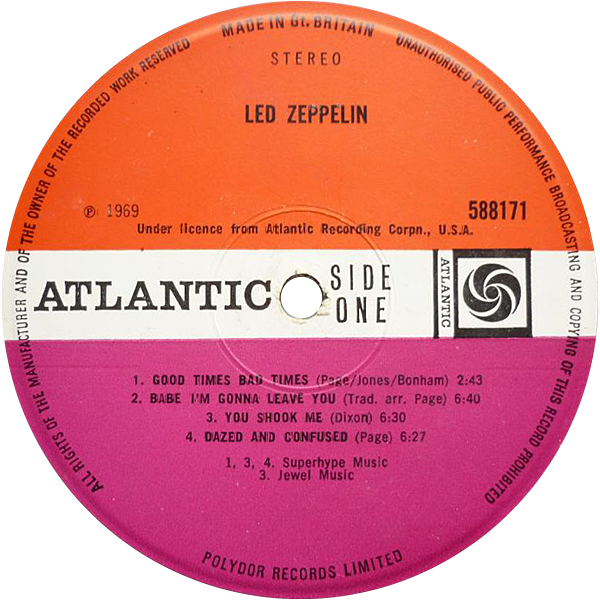 Also, ‘Uptight An’ Outasight’ information on rear sleeve is common to both. This first reissue on the green and orange label now features the new Kinney coding system, the grey stripe on front sleeve has disappeared and also replaces the ‘Uptight An’ Outasight’ wording with the text “Distributed by Kinney Record Group Ltd” on the rear sleeve. 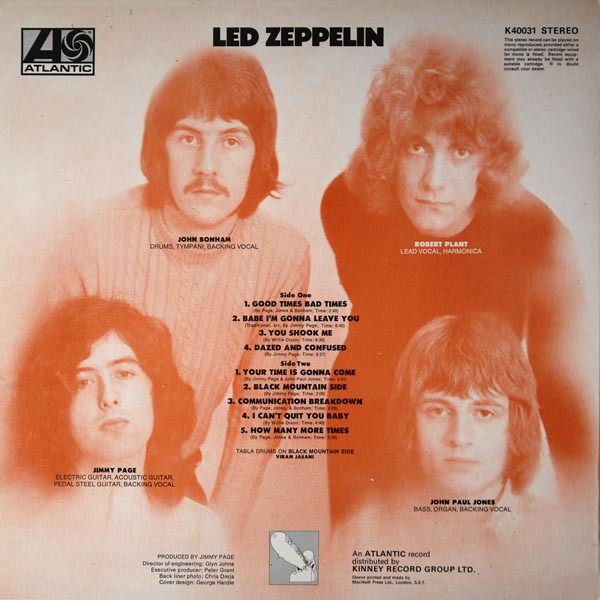 Note the copyright wording on this first reissue label is all contained within the bottom orange segment and there is no ‘W’ logo after the wording. 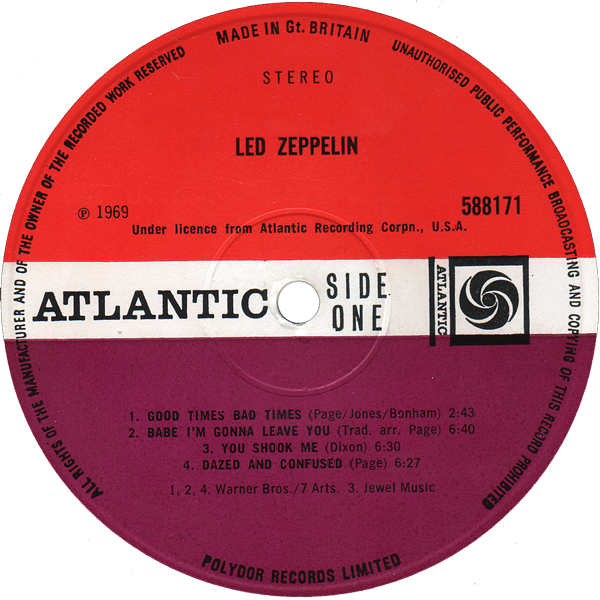 Later mid-70s reissues have this text running through the white band and into the green segment and with a ‘W’ logo at the end. Hi I have found your website very informative and it set me on the road to a better understanding of collecting . I was lucky enough to purchase a zeppelin 1 cross over from eBay after looking at your site for £40 . I have a copy with the turquoise lettering and all of the other information that you have mention. It is a vinyl with more of an orange and pink label. It’s the same one as in your top picture of two vinyls side by side. Mine is the vinyl on the right. Are you able to tell me if this is still an original early press. Hi Alex, yes it is. Great. Thank you for the quick response. So how does it differ from the vinyl on the left? Is the only difference the colouring of the label?